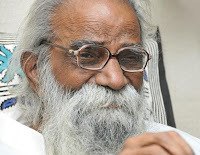 Telugu writer Dr Ravuri Bharadwaja was selected for the prestigious Jnanpith award for the year 2012, he was earlier awarded Sahitya Akademi Award. The 86-year-old writer, who has to his credit more than 37 volumes of short stories and 17 novels among other works, was chosen for the award by a selection board chaired by noted poet Sitakant Mahapatra, a statement of Jnanpith Award committee said in New Delhi on Wednesday. The books of Bharadwaja, who had education till Class VIII only, had been prescibed as text books in universities and even been the basis of many research works. "Bharadwaja passed through all sorts of vicissitudes of life but continued his service to Telugu literature with perseverance. He is a poet, a playwright, a novelist of distinction and a popular science writer," the statement said. About Ravuri Bharadhwaja: Ravuri Bharadvāja was born on 1927. He has written 37 collections of short stories, seventeen novels, four play-lets, and five radio plays. He has also contributed profusely to children's literature. Paakudu Raallu, a graphic account of life behind the screen in film industry, is considered his magnum opus. Jeevana Samaram is another of his popular works. He is educated till Class 7 only. However his books are used as course works in B.A, M.A and there have even been several Phd degrees awarded for research on his works. He got honorary doctorates from Andhra, Nagarjuna and Jawaharlal Nehru Technological Universities for his literary prowess.